Grooms who are actively involved in wedding planning are finding that it can be a lot of fun and a great way to tackle one of the first big challenges of your lives together as a married couple. When couples plan their special day together, everything from color schemes and menus to wedding invitations and flowers becomes an expression of both of you and your love for each other. There is certainly plenty for you as a couple to do together, but splitting up some tasks will ensure that your partner doesn’t become overwhelmed, making the months leading up to the big day exciting and fun as opposed to stressful and hectic. Many couples find that splitting up tasks from the beginning is the best way to tackle a “to do” list. A checklist and setting simple deadlines can also help and often sets the stage for a smooth and productive planning period. 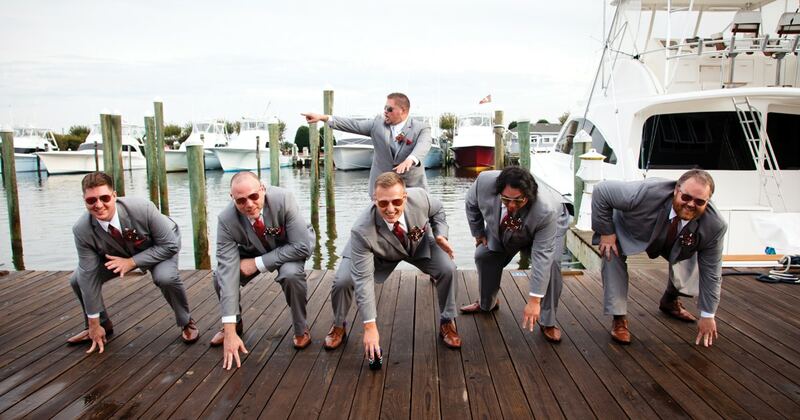 This way both bride and groom know what the expectations are and can work as a team every step of the way. A groom’s responsibilities can vary. 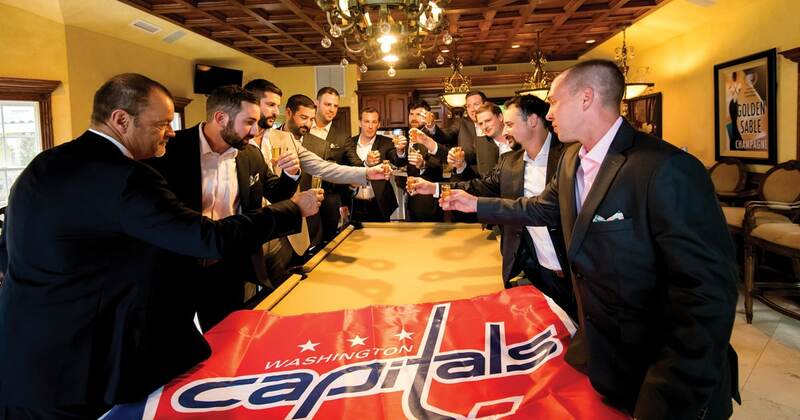 Traditionally, his duties have included some of the reception arrangements, mapping out the transportation logistics, selecting gifts for his groomsmen, and planning the honeymoon and bachelor party. But these duties are definitely not set in stone. Couples these days are sharing tasks in whatever way works best for them. Of course, some tasks may be better suited for the groom and some for the bride, depending on their strengths and personalities. So take the time to consider each of your likes and dislikes and where you think you are best suited to pitch in. Remember, just because you may not be so enthusiastic about labeling invitations, looking at flowers or choosing party favors, these are tasks that must be done and doing them together can make it more manageable and definitely more fun. And don’t forget, it will strengthen your relationship and get your marriage off to a good start! It may serve grooms well to first consider what aspect of the wedding they would like to have the most influence on. Then it’s time to pick a relaxed atmosphere for the two of you to sit down and begin mapping out the months that will end with your special day. It’s helpful to create an outline – minute by minute – of the wedding day and what you need to do to make it happen. 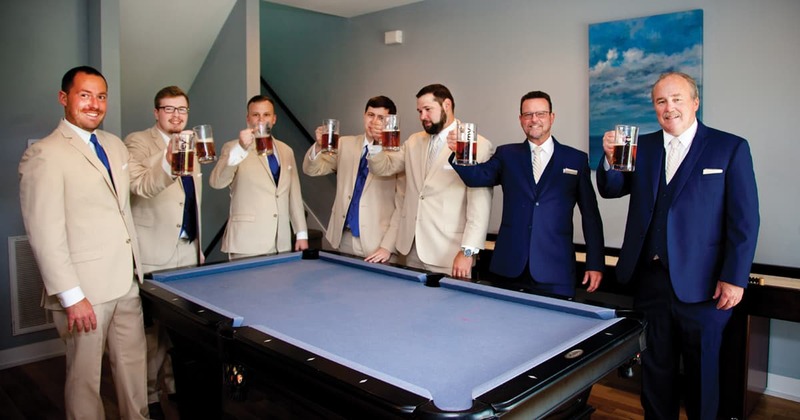 Enlist your groomsmen and other trustworthy family members and friends to help along the way and on the day of the event. 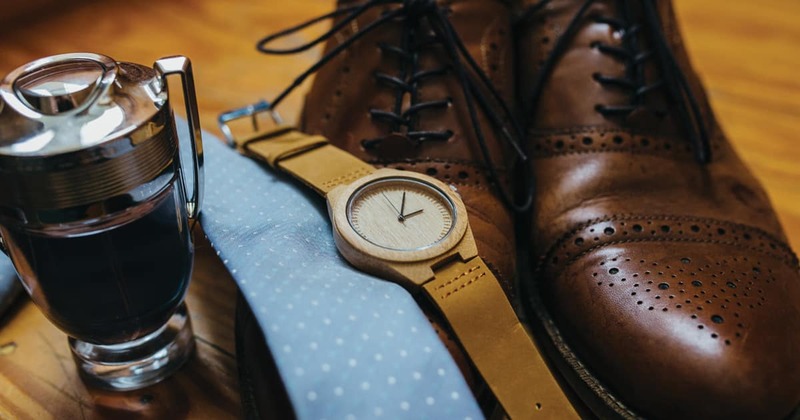 Be sure the list includes everything from choosing your wedding bands to giving the best man the rings. Include the deadline you need for tasks to be accomplished as well as any source material such as phone numbers and addresses. A important contribution grooms could make in the process is helping to do a little research on vendors, not to mention attending vendor meetings with your partner. One more thing – consider the two of you writing your own vows as a way to personalize your day and reflect on your new life together. It would be a perfect way to share some quiet moments as your wedding day draws close. Just because there are “traditional” responsibilities of the groom and his family, it does not mean it is what you and your partner will decide on. More and more couples are sharing the expenses of the wedding and honeymoon. But if you are going the traditional route, grooms typically pick up the tab for the entire rehearsal event including the dinner, invitations, decorations and entertainment. The groom also traditionally pays for the marriage license, the bride’s rings, the officiant’s fee, gifts for his attendants, corsages for the mothers and grandmothers, as well as the bride’s bouquet. May I Have This (First) Dance? What could be more romantic than suggesting to your fiancé that you take a dance class together? It will help you prepare for your wedding day when all eyes will be on the two of you during that first song. You can play a role in choosing the song for the first dance and other songs the band or DJ will be playing. Will your best man have the rings? Is the honeymoon luggage easily accessible? Do you have a change of clothes accessible for your getaway? 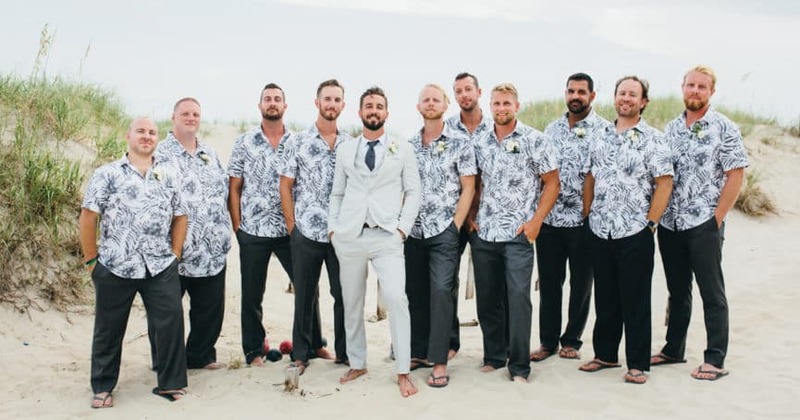 Will your best man return your rental suit for you? Do you have the notes for your toast or speech? How will you keep track of car keys and/or house keys on your wedding day? Most guests know not to bring wedding gifts to the actual ceremony, but inevitably, a few will show up. Assign someone who will be in charge of transporting them to a desired location. Gather passports, credit cards, and other necessary documentation for your honeymoon and keep in one place. Determine who will have the checks or cash to pay the musicians, photographers, drivers, and any other professionals who need to be paid at the end of the event? Make sure you arrive at the ceremony site at least a half hour before the service begins. Give the best man the payment envelopes so he can take charge of paying everyone after the service. Use this time to go over any special seating arrangements with your ushers and double check that you have the marriage license for the officiant and your witnesses to sign after the ceremony. Wedding planning can be stressful, but it can also be fun and be a great way to bring the two of you even closer together. There are plenty of ways you can show your bride-to-be that you appreciate everything she is doing to make your wedding day perfect. Leave a love note inside her purse, pick a wildflower and place it on her windshield, fix her a special dinner or have take-out ready on a particularly busy day. It is also important to be familiar with who will be attending the wedding from her side of the family. You can flip through a family album together or share fun stories about relatives to help connect names and faces. 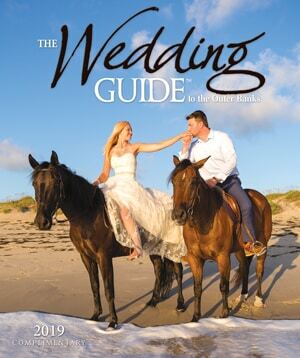 The Outer Banks has something for every groom, no matter where his interests lie. The coast teems with adventures in fishing, surfing, hang gliding, golfing, kayak tours, and more. In between your wedding festivities, make sure you take time to explore our remarkable environment. Head up to Corolla and experience a one-of-a-kind wild horse safari adventure. Tour packages allow you to choose from a guided off-road excursion to see the wild Spanish mustangs or a self-guided tour in a rented four-wheel drive vehicle. If the waves call to you, sign up for personalized lessons with one of the many experienced Outer Banks surfers or stand-up paddle boarders. Or explore the sound in a kayak or from a kite board. If you’re already in the know, rent a board and ride the wind and waves on your own. The island is full of rental companies and instructors. The Outer Banks is a year-round fisherman’s haven. There is fishing, fishing, and more fishing. Book a charter boat to experience inshore and offshore angling with your buddies, or head out to the beach or one of many fishing piers with your rod in hand. You can rent what you need on site if you haven’t packed any gear. Piers generally offer food and beverages to enhance the experience. Be sure to inquire about fishing permits at your local tackle shops or visit www.ncwilidlife,org for more details. Touring the majestic lighthouses of the Outer Banks is a great way to explore history and take in an incredible view. From Corolla to Ocracoke, coastal beacons provide great stopovers, climbing adventures, and photo possibilities. No matter what your preference, you and your guests are bound to find the Outer Banks a memorable place of adventure, natural beauty, and fun. Don’t forget to take your camera – waterproof if needed – to savor your memories for years to come! Traditionally, the groom is responsible for taking care of all facets of transportation: everything from picking guests up at the airport and hiring the wedding day trolley or limo, to making sure guests have maps and designated driver alternatives. Do your research; make reservations when necessary and have a handy list of transportation companies on hand, just in case. Always remember to consider potential traffic congestion, particularly during the tourist season and busy weekends during the shoulder months. For example, if you need to get you or your guests from Nags Head to Duck for a Saturday morning ceremony in the summer, you will need to be sure you allow plenty of extra time due to traffic congestion. There are many ways to get the bride and groom to and from the wedding events in absolute style. From a stretch SUV to an old-fashioned trolley, options exist to suit your style and needs. Keep safety and efficiency in mind as you also consider how to cart your guests to and fro! The biggest reason to consider wedding transportation for your guests is the obvious: drinking and driving. You want your guests to have fun at your reception, but you also want them to arrive at their destinations safely. The legal blood-alcohol limit in North Carolina is .08. That’s just one or two drinks for most people. Plus, out-of-town guests are probably not familiar with directions to wedding venues. Another reason to transport your guests is that parking at rental homes on the Outer Banks is very limited. A typical formula for non-event homes is one parking space per bedroom in the home. Also, parking on the grass can be a costly violation at most homes because of damage to underground septic systems. By providing transportation for guests, you can rest assured that everyone will get to the church (or beach) on time. Remember this tip: Do not wait until the last minute to book wedding transportation. It could cause unnecessary stress and result in confusion and last-minute details to be forgotten. 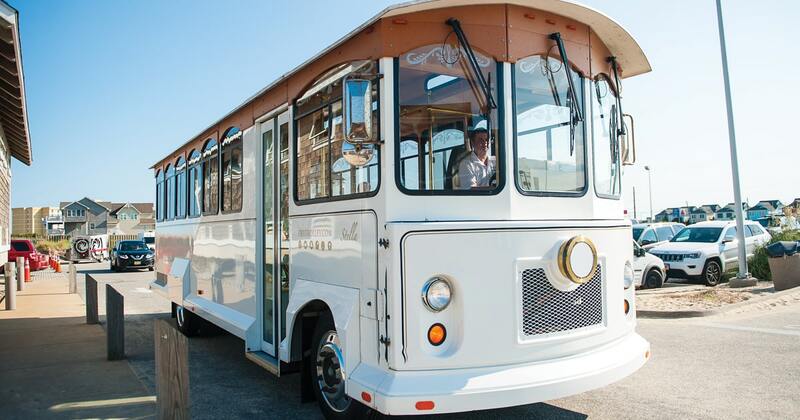 You also need to factor the cost of transportation into your overall wedding budget. When booking your wedding wheels – the earlier the better! Research the vehicle that will be assigned to your event and check on how often it is cleaned: A twenty-year-old limo without proper upkeep may not be the luxurious getaway car that you are envisioning. Always book for longer than you think: It is a good idea to add 20 to 30 extra minutes to each trip to allow for late arrivals and traffic delays. Always book in person: You can do your research online and talk with companies over the phone, but take the time to make your final booking in person so that you can inspect the vehicle. Pay attention to the contract: Read the contract thoroughly before you sign. Double check the date, hours, and pick-up locations. Make sure the company is insured, and research its cancellation and refund policies. Have a family member or friend call the driver 20 to 30 minutes ahead of time to make sure your ride is on the way.